The Music Department is hitting the stage on January 15, 16, and 17. All shows are from 7-9pm here at SLSPA. Click the news article to learn more about each night's offerings. The January 15th show features our amazing Rock Band and Jazz Ensembles as they play a variety of music in just one evening. This show will feature the premier of the first ever Jazz Guitar Ensemble at SPA. 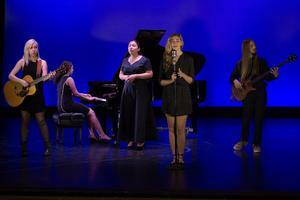 The Jazz ensemble will perform traditional and modern arrangements of jazz standards while the Rock Band will be busting out songs from the 70's and 80's. On January the 16th and 17th you can hear amazing solo performances by members of our Music conservatory.